Having a balcony in the city is a coveted treasure: your own spot of outdoors in an urban jungle, a place to have a morning coffee or afternoon drinks, watch the change of seasons, get a bit of sun on your skin or treat your family with a Sunday barbecue. Even the smallest balcony can be used year around with a bit of imagination and the right kind of furniture. Your furniture has to be lovely, of course, but it also has to be practical, weather-resistant and easy to maintain. Without the right furniture, you will not spend much time on your piece of outdoor heaven. There are some pieces that are absolute must in order to make your balcony an oasis of comfort. Regardless of how small your balcony is, a dining table is a necessity. On a small balcony, it will have to be very small, so think about a wrought iron or chrome bistro table, which can, with a couple of chairs, become a dining table, a cocktail table, a computer table or a card table. It can be used by kids to draw or do their homework, for you to check your emails or just a spot to put your cup of morning coffee. With a colorful table cloth, a couple of candles and a small vase of flowers, your balcony table can become a spot for a romantic dinner. Benches are perfect for balconies because they can serve many purposes. With a bunch of soft, colorful pillows, a bench with a high back can become your favorite spot to de-stress after a long day at work, or snuggle on with the love of your life. Simple backless benches often have storage built in, where you can keep extra pillows, garden tools, blankets, candles or anything else you frequently need on the balcony. Benches can also be pulled up the table for extra seating, serve as a coffee table or as a buffet table during the parties or be used as a stand for your prettiest flower pots filled with seasonal flowers in full bloom. As with a table, choose the material that is weather-resistant and easy to maintain, such as hardwoods, recycled plastic, wrought iron or synthetic wicker. Lounge chairs allow you to stretch in total comfort, have a nap or work on your tan in your new bikini. They come in all forms and shapes and are made of a range of materials, from good old aluminum/ canvas combination, to luxurious teak beauties. You can choose what works best with the design and architecture of your house and balcony. Make sure that they are adjustable so that you can lift the upper part to support your head when you want to read or have a drink. Not too many balconies are big enough to support more than one lounger, but if yours does, get at least two, otherwise you will be fighting for your turn with the rest of the family. Having a sofa or a love seat on your balcony will make it an instant outdoor room. If your balcony is big enough, indulge in a big, plush sofa on which you can fall asleep in the summer under the stars or spend hours chatting with your friends or family. Choose a sofa designed for outdoors. 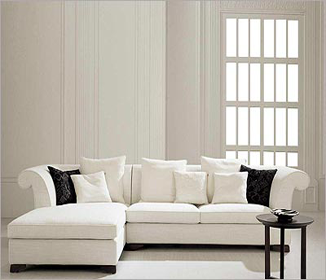 Wicker, rattan, teak or recycled plastic will work well, but don’t drag your favorite leather sofa from the study. The first rain will make you sorry that you did. 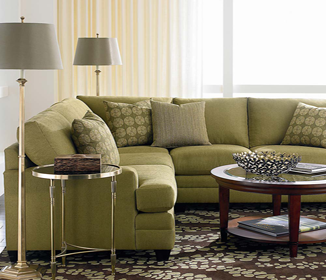 Durable material and weather-resistant sofa cushions with removable covers will allow you to spend your free time enjoying your sofa instead of maintaining it. While the rest of your balcony furniture has to be practical and have multi-use, a hanging egg chair is a pure indulgence. It is actually perfect for balconies because it does not take much space. The egg basket is like a cozy nest and its plush, oversized cushion engulfs you in an embrace of comfort. The best are large size hanging egg chairs, with an oversized basket, so you can cross your legs in it and snuggle with a book. Hanging egg chairs come with their own stands that are made of solid, durable material, strong enough to support even your plump aunt Thelma when she comes visiting. Make sure that the cushion has a removable cover that can be washed when needed, or changed when you get tired of the color. Once you picked up the right pieces of furniture for your balcony, add a potted palm or two, a couple of hanging baskets with flowering plants and an umbrella for those hot summer days. If you are a romantic soul, you might want to hang a few light, white curtains on the side of the balcony, for a bit of privacy or just to add to the perfect atmosphere of your urban outdoor oasis.